Large (12-14) - $40.99 Only 3 left! X-Large - $40.99 Only 1 left! Our brand new Regional Director of Hybrid Costume Development has been busy. As it turns out, year after year there are more and more kids in the word who just can’t decide what costume to choose for Halloween. So we’ve been tasked with brainstorming clever costume combos that will tickle the fancies of our ficklest customers...like your kiddo! Every year he goes back and forth between two different looks--last year he wanted to be both a referee and a monster, equally; the year before he just couldn’t pick between a shark and firefighter! This year, he’s waffling between two classics: a scary skeleton and a brave soldier. What’s a parent to do? You’re in luck! 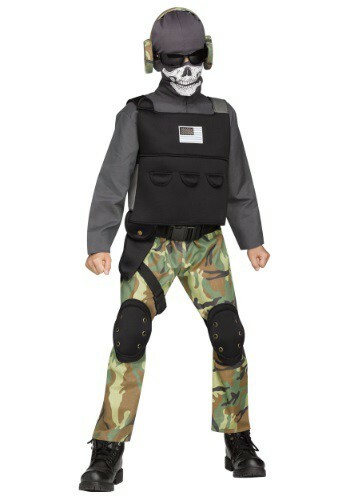 This Boy Skull Soldier Costume just finished beta testing and is our newest hybrid costume, created specifically for kids like yours this holiday! He will absolutely jump for joy at the realization that he doesn’t have to wrestle his warring Halloween heart any longer. And just wait ‘til he sees the outfit! 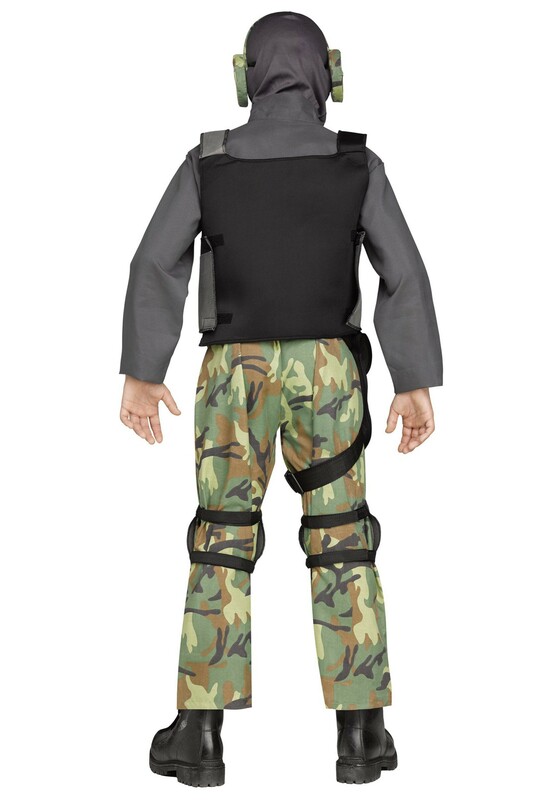 It’s got all the authenticity of army wear (camouflage, padded vest, sunglasses and “headphones”) without the...skin...of a human,so it’s plenty scary, too. He might be an elite sniper or a squadron commander, but one thing's for sure—when the enemy sees his skull face, they'll know that their doom is imminent. Just make sure this skull soldier isn’t here to enlist you in his army; that’s what happened to our previous Regional Director of Hybrid Costume Development.